No Waders and Boots – so I must keep to the shore and the edges of water. Jacket and Hat – my regular Gore-Tex jacket. Fly-Rods + Reel: 9′ 5pc (9wt and 5wt) – will fit in my regular check in luggage. On the bag’s side – floatant, tippet (2x-6x) and nippers. 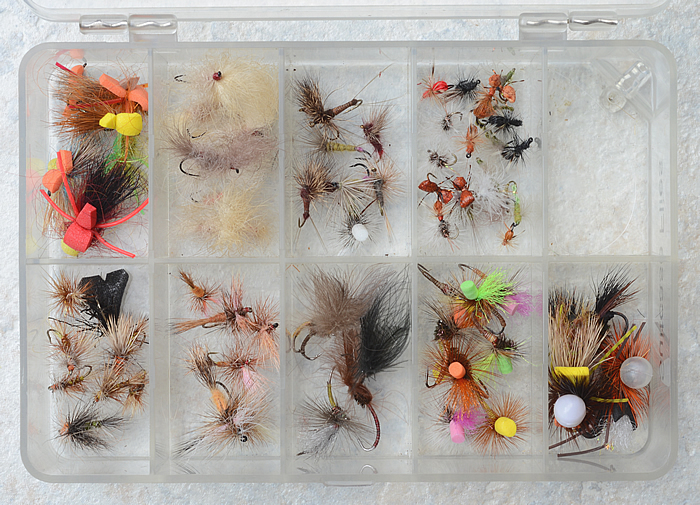 On the bag’s front – a rare earth magnet – as previously reported a catch all convenience to hold flies on the stream as I can things around. Leaders for Dry Flies – 7.5′ (4x pocket water) and 9′ in (5x flat water).